I always think about San Diego as an old friend. But somehow, I haven't been there for a few years. So, come last Sunday, I jumped in a car and, two hours later, I was in Heaven, though the locals call it Balboa Park. My first stop, of course, was at the San Diego Museum of Art. The museum is known for its diverse collections, which includes traditional Asian and classical European art as well as good representation of 20th century art. Right now the museum is hosting a travelling exhibition, Spanish Sojourns: Robert Henri and the Spirit of Spain. The exhibition presents forty paintings by this American artist (1865-1929), whose career spanned the late 19th and the early 20th century. To be completely honest, I'd never seen his works before. The exhibition tells a very interesting story about a very gifted artist who travelled to Europe often but fell particularly hard for Spain, which he visited seven times. "Spanish Sojourns, Robert Henri (1865-1929) and the Spirit of Spain"
His full-length female portrait of a dancer introduced an American audience to a then-new cultural phenomenon –– the tango. Nearby, the full-length male portrait of a Picador evokes the pride and gore of Spanish bullfighting. Robert Henri was a contemporary of John Singer Sargent, whose flamboyant portraits of high society, with their showy brushwork, were obvious influences on Robert Henri's art. There is a pair of half-length female portraits ––one of a gypsy woman with child, another of a society lady. With their bright palette and flowing brushstrokes, both portraits draw your eyes in like a magnet. The difference is that the portrait of the gypsy goes beyond the exotic flamboyance of her outfit. One can tell that she is slightly guarded and wary of our direct eye contact. But she is definitely a force to be reckoned with. In the portrait of the pretty, young society lady, the artist's focus is on her beautiful red gown, while her sweet face remains just that, sweet. Strolling through the museum galleries, I reconnected with a few truly magnificent samples of Old Master paintings that any major museum would be proud to own. Among them, the small Portrait of Issac Abrahamsz, 1635 by Frans Hals and the medium-sized portrait by Francisco Goya of Vicente Maria de Vera de Aragon, Duque de la Roca, 1795. Though the museum collection of 20th century art is not extensive, the well thought out gallery design and intriguing juxtaposition of works make you want to linger. There are a few great paintings on loan there from local private collectors, including portraits by Pablo Picasso and Kees van Dongen. And life-size bronze horseman by Marino Marini galloping towards a large abstract painting by Frank Stella ––their interaction is simply priceless. My tongue-in-cheek reference to Balboa park as Heaven has something to do with another museum located there: the Timken Museum of Art. It is known for its good collection of Old Master paintings, but yours truly always pays a special visit to one gallery, with its small but exquisite collection of old Russian Icons. The current exhibition of Byzantine art at the Getty Villa demonstrates the rich traditions that influenced and shaped these superb and rare Russian Icons. 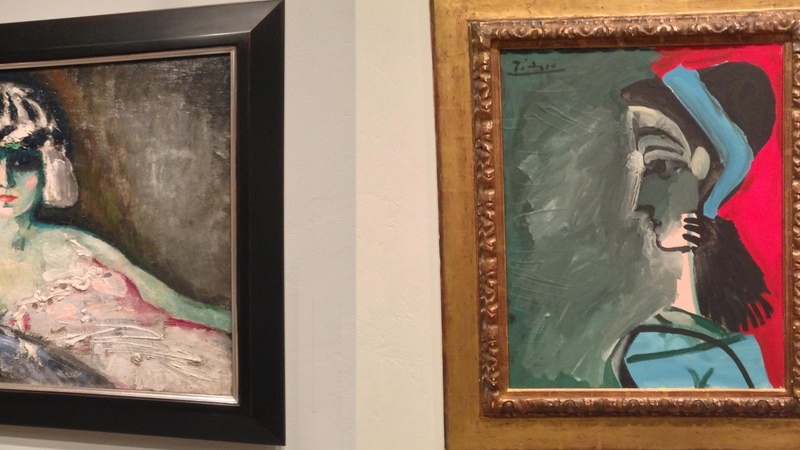 Banner image: (L) Kees van Dongen, "Femme de Commerce de Revue," 1908-09; oil on canvas; (R) Pablo Picasso, "Femme au Bandeau Blue," 1959; oil on canvas; San Diego Museum of Art; San Diego Museum of Art, on loan from private collection. Both from the San Diego Museum of Art, on loan from private collections. All photos by Edward Goldman.